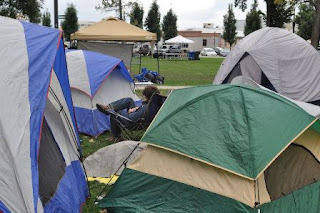 I took some photos of occupyslc yesterday. I went to the march during the Salt Lake Farmers Market thinking that would be one of the events major events. The crowd wasn't that large. I tried talking to a few of the protestors. They were mean and standoffish; so I actually spent more time going through the craft booths at the market ... a much more interesting crowd. The occupy movement appears to be recruiting people for leftwing causes while slamming the brakes on the freedom movement. All of the sites I read are steeped in Marxian dialectics and full of inane demands. My favorite shots were of a guy sitting in the tent city and two bearded ladies showing off their five o'clock shadows.